The United States and France are the pacing and trotting theaters on this last weekend in January. TwinSpires has all the significant action, so load your account and let’s peruse the action from each side of the ocean. The Meadowlands’ offers its first big stakes of the season Saturday, Jan. 29, with series’ finals, all for the older pacing divisions. On Saturday, there is the Presidential Final and the Complex Final, following Friday’s Clyde Hirt Final. On Sunday, Jan. 30, TwinSpires will carry one of the world’s most popular trotting stakes, the Prix d’Amerique from Paris, along with five other races on the program. Exclusive info and analysis is below. Other, older standardbreds keep the action going in overnights across North America. Aside from the non-takeout late Pick 4 at Cal Expo on Jan. 29, we offer you another look into our “watch lists” for suggested contenders going to post this weekend. And, of course, our other weekend selections for Cal Expo at the bottom of the blog are also in need of your attention. At the Meadowlands on Saturday, Jan. 29, the main feature is the $127,000 Presidential Final for free-for-all pacers. The co-features are the finals of $65,000 Complex at $62,600 Clyde Hirt, for older pacers with conditions. First up is the Complex, where superstar St Elmo Hero will try to sweep the series and continue his win streak to 23. His perennial chaser has been Windsong Gorgeous and you can be sure the public will be using them one-two in exactas. But, if able to make the final as an also eligible, Ise The By Boy would be a brave upset choice after being disqualified from finishing fourth last week. If “By” doesn’t make it, watch the Silvermans with Urgent Action, who has finished fourth in both rounds of the Complex, going off with value in both of those starts. “Elmo” will, of course, be tough to topple. Next comes the $62,600 Clyde Hirt Final. A star four-year-old by the name of Summer Camp will also be looking for a series sweep and his fourth win in a row this year. Last week he beat Sniper Seelster for trainer Nikolas Drennan, a 50-percent winning trainer at the Meadowlands so far. Two horses to look out for would be Meirs Hanover and Sniper Seelster. Last of the finals is the traditional January contest, the Presidential. In last week’s episode, a competitive Vlos beat Western Shore in the second division and Bettor Sweet and Alexie Mattosie shared a victory with a dead-heat in the first division. Last week, Schoolkids had some trouble trying to catch the speedy “Bettor” and fast closing “Alexie.” We are looking for an upset with last year’s winner Blatantly Good, who has struggled to get his first win of the season. He may be ready to tackle these, especially since Alexie Mattosie was able to take on Bettor, the figured series winner. The no-takeout late Pick 4 at Cal Expo every Saturday is becoming more popular. If you are betting at TwinSpires from an east-coast location you are getting involved in much of the only late-night action available after seaboard tracks are done with their programs. The California-capital-city mile oval is one of two available for redeye bettors (Fraser Downs in Vancouver is the other). Our ventures into hitting legs of the Cal Expo set have been profitable seperately, though we have not offered a winning Pick-4 combination. Our small-ticket, power-pack approach to taking a Pick 4 down, however, has been resulting in strong winning individual legs. So keep in mind after you put your ticket together that there could be a few high-paying horses in the suggestions we have for leg inclusions. Race 11 – Mad River Hanover put in a real clunker last week. The race before he was highly charged and backed, failing not as miserably. With those two ugly lines showing on his past performances he may be a big overlay in the first leg. Though a loss knocks you out, a brave single here may also launch a giant ticket. Race 12 – Elegant Emma was tough from the 10 hole last week, saving ground and charging late for a place spot. Code Blue has been knocking on the door of a big win and just needs a fine-tuned trip to do it. 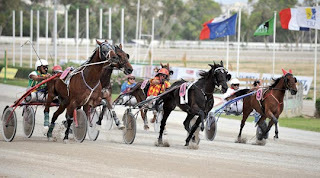 Race 13 – Exit Hanover produced a big brush to the half last out and was forced to race and duel on the outside, still holding well through a strenuous stretch drive. Another single for the stronghearted. Race 14 – Anelectricmachine is still very much in shape after we nabbed him two back at a price and he wallowed home second last week; use him. The mystery horse remains Awesome Deal N. The pacer has had more support than he has been able to live up to but merits another shot if we make excuses for his recent tanks. If overlooked in this by the public while racing how he should have three back, any P-4 ticket with him included is heading for the bank. The Prix d’Amerique trot from Hippodrome Paris-Vincennes, will be a six-race card on TwinSpires, with the main event as the first race, going to post at approximately 9:50 a.m. Eastern Time. The last race will go to post at approximately 12:25 p.m., Eastern. One-million euros will be divided between the first seven finishers of this historic race honoring the United States. It is expected that Ready Cash will be sent off as the public choice for trainer Thierry Duvaldestin, from Lower Normandy. This is a six-year-old who was an easy winner in the Prix de Bretagne recently. Having had much success prepping for this event at Vincennes, Franck Nivard will drive. Maharajah, the expected second choice, is a Swedish champion (there has been only one Scandinavian-trained winner in the last 15 events). Örjan Kihlström will drive him. In his native land he is known as “the trotter that never tires,” but that alleged stamina will surely be tested on French soil. Defending champion Oyannax could be back but this time is valued at 8-1. He was a victor at 172-1. He was recently third behind Ready Cash in a prep. Other possible trotters in the field include Iceland, the winner of the 2010 Elitlopp (19-1); Quaker Jet (8-1); Olga du Biwetz is labled 14-1; Nouba du Saptel, a 10-year-old, gets early odds of 16-1; and a 59-1 Ilaria Jet, from Italy. Expected to be an outsider is Nuit Torride, who is our early choice. She is getting better with age and has a wicked closing kick that could work here if she is not burdened by traffic. Traffic is the key element in this race and drivers are extremely aggressive when they let their trotters hit their best stride. Like an auto drive around the circle at the Champs de Elysee, the trotters in this race find their own paths to victory. All of the races on this card will feature the strong antics of French drivers, who think nothing of pushing their steeds two and three wide in a big field. The course is kind to outsiders and many win at the urging of their forceful pilots. At Northfield Park, Jan. 28 includes four horses we have on our watch list for the Cleveland track. Race 2 – (5) Moira’s Intended; Race 3 – (1) Europan Vacation; Race 5 – (3) Beauty’s Life and (6), Ferris Wheel. At Maywood on Jan. 28, check out if Richard Traci makes it from the also-eligible list into Race 1. We also suggest: Race 4 – (9) Prime Minister; Race 5 (3) Odds On Emanuel; Race 9 – (3) Fox Valley Ruler; Race 10 – (8) Windy City Ron; and in Race 14 – (2) Trail Master and (3) Triggerfish. All of our watch-list horses are suggested based upon recent trips, wagering support and personal evaluations after viewing their performances.